11 tips for a cleaner than clean home! Having to clean our homes, our mothers and grandmothers acquired very practical tips that were passed down from generation to generation from mother to daughter, over the years. And many of these tips have been circulating on the Net for a few years now. But new ones appear every day! If you're still looking for great ideas to improve your ways of performing house cleaning tasks, either by getting the chores done in a more timely manner or by saving money on household products, we recommend you check out the 11 tips in this article . So clever one might say they are brilliant! Use a foam roller to wash mosquito nets! Nothing will capture more cobwebs and dead insects than these powerful adhesives! It's genius! 2) A butter knife and an old rag will deal with the worst dirt on an air duct filter! 3) Add some floor cleaning soap to the toilet brush container. Never again will this brush emit funny odors. 4) A Magic Eraser Sponge is incredibly effective for washing baseboards! You know all these scuff marks from shoes that are so difficult to remove that we feel obliged to repaint everything? Try it! 5) Fabric softener sheets will remove soap stains from shower doors like magic! Their rough texture serves as an abrasive! 6) Make your hardwood floors shine like never before! Mix 1/2 cup (126 mL) white vinegar, 15 mL (1 tablespoon) Castile soap, 65 mL (1/4 cup) rubbing alcohol and 500 mL (2 cups) hot waterin a spray bottle and wash your floor with this solution. 7) For impeccable tap handles, the interior must also be washed. Unscrew the old models of handles and use cotton swabs to wash the rust inside the handles, where the rusty screw is located. Your handles will shine like new! 8) If your garbage disposal machine smells odd, it's probably because food has stuck to it. Use an old toothbrush to take off these foods from time to time by pulling on the rubber that serves as protection for the garbage disposal. 9) Make your stove-top shine like new by mixing baking soda, some blue Dawn dish soap and hydrogen peroxide. Make a nice paste that you will apply everywhere on the stove. Leave on for about 15 minutes, then wipe with damp paper towels. 10) Vacuum a dozen "Downy Unstopables" pellets with your vacuum cleaner if it gives off bad odors when you turn it on. 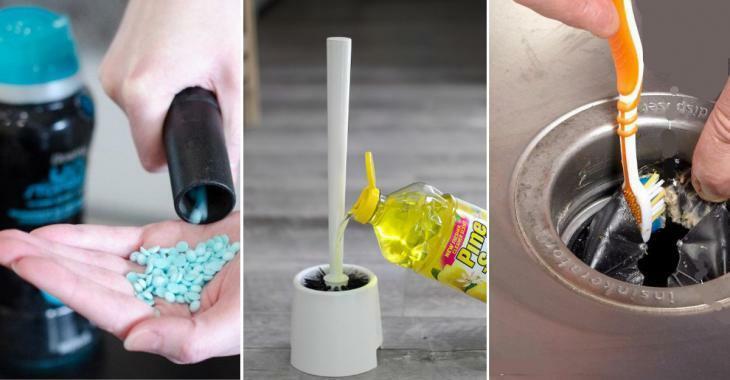 With this trick, the heat of the motor will activate the fragrance of Unstopables and the sweet scent should perfume your vacuum cleaner for a few weeks. 11) Make a paste using baking soda and a little water to make the kitchen sink shine more than ever! Apply the paste all over the sink. Leave the paste in place for about ten minutes. Then rub it in circular motions after 10 minutes. Rinse thoroughly with clean water. Do you like all these tips? Share them!